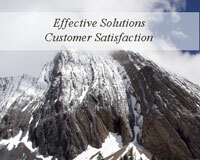 e1 Solutions applies technology and business process expertise to improve clients' business results. Our team, on average, brings more than ten years of business and technology experience to clients' business solutions. Customers ... Customer satisfaction is the most critical element of our success. Results ... Success is measured by our ability to deliver solutions that improve our clients' business results. Partners ... A win-win approach is integral to all of our partnerships. Employees ... Our Team's knowledge, innovation and commitment to excellence are key to our success. Growing number of satisfied clients year after year.